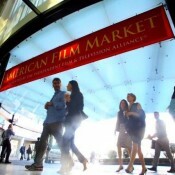 Encore client, American Film Market (AFM), wrapped up its 38th edition several weeks ago, with exhibitors up 18%, attendees up 6%, and film buyers from 71 countries. Digital advertising played a key role in attracting buyers, filmmakers, producers, writers and directors from around the world to the 200,000 square foot exhibition and industry’s largest conference series. AFM made its largest ever spend in programmatic media buying this year, including retargeting, and leveraged the granular control over ad delivery enabled by programmatic to optimize frequency across its ad portfolio. Having run more than 100 million online ads in 200 countries over the past several shows, AFM has had the opportunity to analyze lots of data regarding frequency and continuously evolves its strategy here. Frequency is a key driver of attendee acquisition campaigns because it takes multiple exposures of your message to drive a ticket purchase. If you run too few impressions, you risk losing ticket sales, and if you run too many, you risk wasting ad spend. Finding that “optimal frequency” can be challenging but the quest is well worth it. Due to the long purchase cycle for AFM passes and wide flight window (5 months), using an unrestrained frequency cap for retargeting would deliver too many ads too quickly. AFM’s strategy was to deliver a high cumulative frequency over the window and a low daily level in order to stay in front of potential attendees but not overwhelm them. Keep in mind a frequency cap of 30 per month is much different than a cap of 1 per day because you could burn through the first type of cap in a day. A priority objective was to increase reach so the campaign was designed to avoid sacrificing reach for unnecessary frequency i.e. delivering too many ads to some means not delivering enough, or any, to others. AFM ran its tightest ever frequency cap this year for its retargeting campaign, and saw its best reach numbers ever. AFM scaled the frequency of its retargeting campaign over the flight window, changing it as the event got closer. Keep in mind people who entered the audience pool at the back end of the flight window have not had the level of exposure as people who entered at the beginning of the campaign. However, they too must be exposed to multiple ads to affect purchase intent. The frequency varied by type of ad inventory. The highest level ran against AFM’s highest intent audiences via retargeting, and much lower levels were used for other interest based advertising which was used to boost reach. While AFM capped against impressions for display ads, it used a layered strategy for video, capping against both impressions and views. AFM deployed a robust creative asset portfolio – more than 50 different ad units. By rotating creative, users were exposed to different ads vs. seeing the same ad over and over again which reduces the effective frequency and creative burnout. Think holistically about the user experience, factoring media weight as well as creative weight into your advertising strategy. There is no magic frequency for maximizing attendance, what works best for your show will depend on a number of factors so test, analyze, optimize and iterate.